The prediction seems just as pertinent among established scientists as it is with new-age truthers. That being the concept of a large coronal mass ejection from the sun that has the potential to drastically impact life on planet Earth—possibly for ages to come. This is a common topic of discussion within modern alternative communities, and considering the voluminous amount of information presently available to us, it is easy to see why. This prediction has been popular within numerous ancient prophecies from multiple cultures around the world. It has been predicted by multiple scientific establishments and research endeavors, and has been exhaustively speculated upon by independent researchers. But what might these past solar events reveal, and how can we predict such an alien experience? According to both ancient and modern scientific study, the universe does not merely function as a random progression of happenstance, but as an organized and largely predictable symphony of complex continuity. There is, of course, some degree of seemingly random occurrences which can take place in the universe, but even these events are calculable to some degree. Solar activity appears to be one of these attributes of predictability. The simple fact that the sun experiences cycles—periods of high and low stability, of high and low energetic output, and various other trends of progress throughout its life cycle—reveals that the star can be predicted to some extent. Each star in our night sky is subject to the cosmic energetic influences that surround it (heat, radiation, electromagnetic, and gravitic shifts). Consequently, whenever the cosmic environment shifts, we can expect the star to shift in some way as well. According to established scientific sources, our sun is presently experiencing one of these shifts, and this is where our subject of interest begins to take shape. The Carrington event of 1859 was an occurrence that will not soon be forgotten. This event of a massive coronal mass ejection (CME) was possibly the largest solar event to take place in centuries. This CME may be viewed by some as a singular event. However, if modern scientists are correct in their assessment of our current galactic environment, the Carrington event may be more significant than the number of reports it produced. Before getting to those subjects, however, let's become acquainted with the details. A magnetogram recorded at the Greenwich Observatory in London during the Carrington Event of 1859. Noon approached on September 1, 1859, and British astronomer Richard Christopher Carrington was busy with his favorite pastime: tracking sunspots, those huge regions of the star darkened by shifts in its magnetic field. He projected the Sun's image from his viewing device onto a plate of glass stained a "pale straw colour," which gave him a picture of the fiery globe one inch shy of a foot in diameter. The morning's work went as normal. Carrington patiently counted and charted spots, time-lining changes in their positions with a chronometer. Then he saw something unusual. "Two patches of intensely bright and white light broke out," he later wrote. Carrington puzzled over the flashes. "My first impression was that by some chance a ray of light had penetrated a hole in the screen attached to the object-glass," he explained, given that "the brilliancy was fully equal to that of direct sun-light." The astronomer checked his gear. He moved the apparatus around a bit. To his surprise, the intense white patches stayed put. Realizing that he was an "unprepared witness of a very different affair," Carrington ran out of his studios to find a second observer. But when he brought this person back, he was "mortified to find" that the bright sections were "already much changed and enfeebled." "Very shortly afterwards the last trace was gone," Carrington wrote. He kept watch on the region for another hour, but saw nothing more. Meanwhile, the explosive energy that he had seen rushed towards him and everyone else on earth. It hit quickly. Twelve hours after Carrington's discovery and a continent away, "We were high up on the Rocky Mountains sleeping in the open air," wrote a correspondent to the Rocky Mountain News. "A little after midnight we were awakened by the auroral light, so bright that one could easily read common print." As the sky brightened further, some of the party began making breakfast on the mistaken assumption that dawn had arrived. Across the United States and Europe, telegraph operators struggled to keep service going as the electromagnetic gusts enveloped the globe. In 1859, the US telegraph system was about 20 years old, and Cyrus Field had just built his transatlantic cable from Newfoundland to Ireland, which would not succeed in transmitting messages until after the American Civil War. The line was in most perfect order, and well skilled operators worked incessantly from 8 o'clock last evening till one this morning to get over in an intelligible form four hundred words of the report per steamer Indian for the Associated Press, and at the latter hour so completely were the wires under the influence of the Aurora Borealis that it was found utterly impossible to communicate between the telegraph stations, and the line had to be closed. Boston operator, (to Portland operator) - "Please cut off your battery entirely from the line for fifteen minutes." Portland operator - "Will do so. It is now disconnected." Boston - "Mine is disconnected, and we are working with the auroral current. How do you receive my writing?" Portland - "Better than with our batteries on. Current comes and goes gradually." Boston - "My current is very strong at times, and we can work better without the batteries, as the Aurora seems to neutralize and augment our batteries alternately, making current too strong at times for our relay magnets. Suppose we work without batteries while we are affected by this trouble." Portland - "Very well. Shall I go ahead with business?" Boston - "Yes. Go ahead." Telegraphers around the US reported similar experiences. "The wire was then worked for about two hours without the usual batteries on the auroral current, working better than with the batteries connected," said the Washington Daily National Intelligencer. "Who now will dispute the theory that the Aurora Borealis is caused by electricity?" asked the Washington Evening Star. Working with solar-powered telegraph lines sometimes proved to be risky, however. As the sky filled with light, East Coast telegrapher Frederic Royce struggled to get his messages to Richmond, Virginia, his hand resting on the iron plate of his gear. Distracted by the displays, he also leaned on the system's "sounder," which indicated by audio whether the circuit was connected or not. At the same time, his forehead touched its ground wire. "Immediately, I received a very severe electric shock, which stunned me for an instant," Royce wrote to The New York Times. "An old man who was sitting facing me, and but a few feet distant, said that he saw a spark of fire jump from my forehead." The night of Carrington's discovery, the electrical hurricane that had swept the globe peaked. 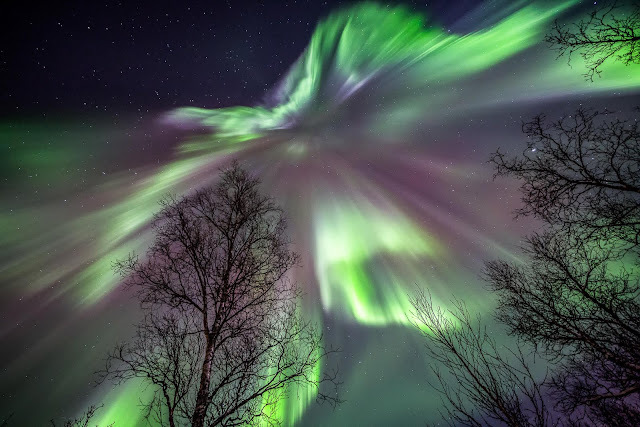 The Great Auroral Storm had actually begun several days earlier with a similar incident on August 28, but it was Carrington and another astronomer, Richard Hodgson, who identified one of the solar flares that enveloped the earth in a week-long magnetic maelstrom. Because of their work, the episode was dubbed the "Carrington Event," and it consumed the world's attention for the week. At that time almost the whole southern heavens were in a livid red flame, brightest still in the southeast and southwest. Streamers of yellow and orange shot up and met and crossed each other, like the bayonets upon a stack of guns, in the open space between the constellations Aries, Taurus and the Head of Medusa—about 15 degrees south of the zenith. In this manner—alternating great pillars, rolling cumuli shooting streamers, curdled and wisped and fleecy waves—rapidly changing its hue from red to orange, orange to yellow, and yellow to white, and back in the same order to brilliant red, the magnificent auroral glory continued its grand and inexplicable movements until the light of morning overpowered to radiance and it was lost in the beams of the rising sun. Popular descriptions of the spectacle appeared everywhere. In 2006, a team of space scientists assembled a collection of eyewitness newspaper accounts of the storm. What stands out in these reports is the astonishment, awe, and even pleasure that the world experienced for a week—followed by a sobering realization of how close our planet is to its indispensable star. In Cincinnati, the aurora came "like that preceding the rising moon, while in the west a delicate crimson seemed to be thrown upwards, as if from the sun, long since gone down," wrote a journalist for the Cincinnati Daily Commercial. Later, these strange fires overran the entire heavens—now separating into streamers, gathered at the zenith, and forming a glorious canopy—then spreading evenly like a vapor, shedding on all things a soft radiance; again, across the sky waves of light would flit, like the almost undistinguishable ripple produced by the faintest breeze upon the quiet surface of an inland lake; a pale green would now cover half the firmament from the east, while rich crimson met it from the west—then the ruddy light would concentrate itself at the zenith, while beneath it fell in folds of beauty the mild purple and green. To the east and to the west lay huge fields of luminous clouds, tinted with a bright rosy flush, wholly unlike that produced by the rising sun and if possible even more beautiful. And so it went around the United States and the world. The sky appeared "blood red," noted the New York Herald. The storm produced "a beautiful halo, and at another period it had the effect of falling from the apex in showers of nebulous matter like star-dust," reported the The Hobart Town Mercury from Tasmania. Not all reporters welcomed these images with pleasure. "Half-past eleven. The appearance now is positively awful," wrote a horrified correspondent for the San Francisco Chronicle on September 5. "The red glare is over houses, streets, and fields, and the most dreadful of conflagrations could not cast a deeper hue abroad." Others took a pragmatic approach to the moment. "Singular as it may appear, a gentleman actually killed three birds with a gun yesterday morning about one o'clock [in the morning]," disclosed the New Orleans Times Picayune, "a circumstance which perhaps never had its like before. The birds were killed while the beautiful aurora borealis was at its height, and being a very early species—larks—were, no doubt, deceived by the bright appearance of everything, and came forth innocently, supposing it was day." What did people in 1859 think of this remarkable solar spectacle? Scientists had been watching sunspots and other Sun phenomena by telescope since the days of Galileo in the early 17th century. Through the second half of the nineteenth century they began to zero in on the link between solar events and geomagnetic storms. As space science historian R. A. Howard notes, these discussions continued through the 1940s, and led to the identification of Coronal Mass Ejections—huge bursts of mass and magnetic field energy from the Sun, provoked by the breaking and reforming of solar magnetic field lines. Orbiting space instruments photographed CMEs in the 1970s—documenting the expulsion of matter from our solar system's energy source. In the months shortly after the incident, newspapers and scientific journals found other possible causes. Scientific American postulated falling debris from active volcanoes, the San Francisco Herald theorized about "nebulous matter" from "planetary spaces," and Harper's Weekly settled on reflections from distant icebergs. As for Carrington, he modestly warned against "hastily connecting" what he had seen to the dramatic events of the week. "One swallow does not make a summer," he observed in the Journal of the Royal Astronomical Society.
. . . ‘mid terror, we still Can a symbol behold Of the Heavenly Love In the flame o’er us rolled; Evermore, evermore Though in mantles of fire, There are pitying smiles From our God and our Sire - O Lights of the North! As in eons ago, Not in vain from your home do ye over us glow! The Carrington Event is always remembered following a major solar flare, such as the remarkable eruption on the Sun's surface caught by NASA space cameras on April 16. And in the aftermath of such incidents, we do what we do best these days: we worry—about our machines and our money and our future. There's a one-in-eight chance of a Carrington-like magnetic storm over the next eighteen years, warns one study. Another notes that the consequent disruption to the global infrastructure could cost trillions of dollars. Putting religious and metaphysical questions aside, how much did all this disruption cost the US telegraph system? The compilers of these eyewitness accounts note a subsequent assessment by Scientific American that the average telegraph operator was worth about $75 a day to his company. Assuming that half the extant telegraph stations (1,500) were disrupted in some way, the researchers guesstimate a cost of $56,000 to the States, and perhaps $270,000 to the whole world. Combining general telegraph business revenue loss with operator labor revenue loss, they expand the global sum to something in the neighborhood of $300,000. But that doesn't include ripple costs—to stock markets, to businesses that used the telegraph, and to families. "Other than the occasional anecdote reported in the newspapers, we have no contemporary means to truly gauge the economic impact of these two auroral events," they conclude. The Carrington event was but one of several measurable solar eruptions which have historically impacted life on Earth. The problem is that there is not enough initiative within the current establishment to fully consider the potential impact of a similar event taking place today. Nevertheless, further CMEs of similar or greater magnitude can occur, according to research. This is not to promote fear of any kind about the impact of a CME event in our current time, but it is intended to help us consider the possible changes that can generally take place in our solar system. There are numerous possible impacts which another CME can have on current civilization—some of which may be potentially destructive to the current power grid infrastructure. However, with proper infrastructural upgrades, these problems may be alleviated. According to ancient records, the more recent CME events (taking place in the past few centuries) pale in comparison to the true energetic potential of our sun. Many of these records appear to describe solar events which take place every several thousand years which quite literally change the face of the planet. This may involve a shifting of oceans, volcanic eruptions, inclement weather, earthquakes and a number of other events. However, before becoming too fearful of such occurrences, we might keep in mind that here in the 20-teens, we have already experienced these things, and yet we are still here. The fact is that the sun's energetic output commonly affects the energetic occurrences upon, within, and around the Earth. According to research, solar energy even holds the potential to affect human consciousness. The ancient records from around the world seem to indicate some type of choice of opportunity which humanity has with regard to their experience following large solar events. It is common that massive changes follow such an impactful event as the Carrington CME. However, the change we are referring to can take place within the human mind. Many ancient texts commonly expressed the principle that the environment and the Earth surrounding a civilization is directly linked with that civilization. In other words, ancient human cultures believed that when a community or population is in harmonious balance, the energetic environment around that group will be equally harmonious. It has already been scientifically proven that human consciousness holds the potential to affect electronics and the surrounding electromagnetic environment. This suggests that the opposite—that an energetic environment can consciously affect the people within it—might be true as well. With these possibilities in mind we may be surprised to see that ancient records and religious scriptures suggest the possibility of solar impact on human consciousness. Two motion pictures from the recent past actually depict the phenomenon of solar activity impacting the planet in various ways. Though these depictions appear to be designed to invoke fear, they do seem to suggest at least some knowledge of the concept. We may all remember the movie Knowing—directed by Alex Poyas and staring Nicholas Cage. This movie was a somewhat dismal interpretation of this concept of intense solar activity which can take place once every several millennia or so. The movie begins with an omen of progressively tragic events where the deaths of many people were accurately counted. At the end of the film, the sun was shown destroying the planet. Though fatalistic movies such as Knowing may not portray the accurate representation of solar activity, it does show us at least one interpretation of what some occult groups believe about multi-millennia solar activity. If the total destruction of the planet took place every several thousand years, we would not be here to speak about the concept. Though this film was fatalistic in many respects, it did portray a certain portion of ancient prophecy. According to multiple ancient texts, the Earth does experience a cleansing of sorts every several millennia. There is somewhat of a destructive occurrence which is said to only remove destructive, negatively oriented, and self-serving people from the planet. However, those who are generally good natured continue on the planet unharmed, and even prosper in tremendous ways after the event takes place. This bifurcation of positive and negative paths seems to be hinted at in another film which depicts both a massive solar event, and the rescuing of certain individuals from a planet adjacent to the star. The movie was Star Trek: Generations. This film—directed by David Carson, with a star-studded cast of the original crew from the Star Trek-TNG series—depicted one scientist named Soran who sought to return to a galactic anomaly which simulated whatever an individual desired to experience called the Nexus. In order to direct this Nexus to a specific location on a planet, this scientist created a device that exploded stars and by doing so, he altered galactic gravity fields which changed the course of the Nexus through the galaxy. During the scene when Soran reaches the planet, he successfully destroys the adjacent star and is swept away by the Nexus soon after. This movie may have simply been a random work of science fiction. On the other hand, it seems to depict a bifurcation which is depicted in ancient prophecies. According to these prophecies, certain people will be whisked away and rescued while others may experience an end-of-the-world scenario. According to these prophecies, an individual must be good-natured and focused not simply upon fulfilling their own interests, but working to take care of those around them. Though Soran is the villain in the Star Trek film, the ancient concept of the destiny of positively oriented and negatively oriented people can be clearly seen. We do not have absolute proof that either of these films is even partially accurate. However, if anyone should be worried about the results of solar eruptions, according to ancient prophesy, the only requirement to weather the storm is simply to be a good person. We cannot say for sure what will or will not take place in the near future. However, we do have significant evidence to consider what possible events might take place when the sun has its next flare-up. Whatever does occur, we can be sure it will be spectacular.